A SikuliX script is a workflow, that tries to perform actions against the GUI seen on a real screen, that otherwise must be performed manually. Usually it is a series of waiting for images to get visible on the screen and actions (mouse and/or keyboard) on visible GUI elements. The workflow statements usually are complemented with other elements of the used scripting language to implement more complex solutions with decisions, repetitions and states. In the IDE as standard the “foobar.png” are shown as thumbnails of the images (other options available). To write, execute and debug SikuliX scripts you should know about the features of SikuliX and have at least a basic knowledge about the used scripting language. A good starting point is to use the SikuliX IDE, to get used to the SikuliX features. If things become more complex it might make sense, to switch to another IDE that supports your selected scripting language better. A SikuliX script consists of one file containing the statements of your scripted workflow and zero to many image files, that you have captured, to support your workflow. This bunch of related files is meant when we talk about a SikuliX script. How to run such a script is shown in the next chapter. The standard storage for a SikuliX script is a folder/directory having the name that you have given to the script, when saving it from the IDE. It is mandatory, that the contained scriptfile has the same name as the folder, which is guaranteed, when working with the SikuliX IDE. To avoid any problems, you should never directly access the folder content outside the SikuliX IDE, except you really know, what you are doing. On Mac the folder is seen as a package/bundle, which at the top level in Finder hides the content. There are two other storage variants for SikuliX scripts: zip-file and jar-file, which are intended for distribution of your scripts. Both variants pack the SikuliX script content in one file, which makes distribution easier. Both variants can be run with the means of SikuliX, as long as the target system has a valid SikuliX installation/setup. The jar-file variant has an option to be packed together with the scripting and SikuliX feature support (self contained), so it might be run on systems only having a valid Java installation. It can be created in the SikuliX IDE with the file menu entry “Export packed source” and gets the ending .skl instead of .sikuli. As such it cannot be reopened for editing nor used for import, it can only be run using SikuliX features on systems having a valid SikuliX setup. In fact it is simply a zip-file, which can be brought back to a .sikuli folder using a zip utility. So be aware, that this variant does not really hide your script content. It can be created in the SikuliX IDE (file menu entry “Export as jar”). It can be run using SikuliX features on systems having a valid SikuliX setup. The script source is contained in compiled form (Java byte code) and hence not visible, even if one accesses the jar content. So this variant gives some level of secrecy for your scripted workflow. There is a sub-variant, containing the scripting and SikuliX feature support additionally to the script content, which makes it runnable even on systems not having a valid SikuliX setup, but only a valid Java installation. Be aware, that such a jar has at least 60 MB though. How to make and use it look here. In the SikuliX IDE a currently open script in the frontmost editor tab can be run by clicking the run button. Saved scripts (.sikuli) and exported scripts (.skl and .jar) can be run from commandline (see) or from within other scripts (see). It looks like, that Nashorn might be removed with Java 11+ (it is still there though in the current early access versions). Until I have a solution, in case you have to stick with Java 10 to use Nashorn. The SikuliX features in general have to be used like in Java programming. All classes from org.sikuli.script are known (pre-imported). Debug and Settings are also known. FindFailed is not thrown! internally returns null! If you want to catch exceptions, you have to use the dotted methods. Out of the box, SikuliX can be setup with a Jython standalone package, which then is only available to SikuliX to run scripts in SikuliX IDE or from commandline using SikuliX. You might use export or any other appropriate method. if you do not get pip ready, don’t bother: Jython is useable without it. The caveat: any additional packages have to be installed/setup manually. You can run SikuliX scripts using <path-to-jython>/bin/jython <path-to-youNameIt.sikuli>/youNameIt.py. In a Python IDE you have to setup your project according to the rules. sikulixapi.jar (NOT sikulix.jar!) must be on the Java classpath at runtime. This can be achieved using one of the methods that come with Jython or the IDE. If this case is planned to be your main usage, you should decide to use plain .py files according to the Python script/module rules and the ImagePath features to acces your images. You can use the SikuliX IDE to capture your images even in plain .py files (see plain .py in IDE). If you want to run scripts from within the SikuliX IDE or from commandline using SikuliX, just open and run the main script unchanged (see plain .py in IDE). You have to tell SikuliX about your installed Jython by using the Extensions feature. The following approaches apply to situations, where you want to use Python modules installed somewhere on your system, without the need to manipulate sys.path, meaning, that when using ìmport moduleXYZ this package is found automatically. In the folder SikulixRepo/Lib/site-packages have a file sites.txt, that contains absolute paths one per line, that point to other places, where modules packages can be found. These paths will be added automatically at startup to the end of sys.path in the given sequence. You might prepare jar files containing Python scripts/modules/packages, Java classes and other stuff like images, that are intended to be used in the scripting context. you want to pack scripted stuff together with other resources into a container ready to be used by yourself or others via import (which is not supported by the .skl packaging method). you want to secure your script code against modifications by others, that use your distributed jar. Later (possibly only with version 2) there will be a feature available, to run such script containers directly from commandline (java -jar mystuff.jar parameters) or by double clicking. You might use the Java jar utility (contained in the JDK). Or use the SikuliX provided feature Sikulix.buildJarFromFolder(jarpath, folder), where jarpath is the absolute path to the jar (the parent folder must exist, the jar is overwritten), that should be created and folder is the absolute path to a folder, containing the stuff to be packed. The content of the folder is copied to the root of the created jar. Just run Sikulix.buildJarFromFolder(jarpath, folder) in an empty tab in the IDE or in a script, that might do some pre- and/or postprocessing. copies the complete content from sourcefolder to targetfolder (the parent folder must exist, the folder is emptied if exists) and then traverses the targetfolder replacing each foobar.py with it’s compiled version foobar$py.class, that contains JVM-byte-code, so your script code cannot be edited anymore in this targetfolder, but still be used with import foobar. Be aware: Be sure, your code compiles without errors, because the compile feature either succeeds or fails (compile errors), but you will not get any information about the cause or even the place of the compile problem. Comments and ideas are welcome and can be posted there as issues. Among the free IDE’s, that allow to work with Python projects, I made the best experiences over the years with JetBrains’s PyCharm (using the free Community Edition) or the Python plugin in JetBrain’s IntelliJ IDEA. PyCharm has a weakness, in that code completion while editing does not look into jar-files nor Java classes, while in the built-in Python console after having imported a Java class, code completion about the class attributes/methods works, so having a console open while editing might help as a workaround for inspecting Java classes. IntelliJ IDEA with Python plugin supports complete code completion (while editing and in console) including Java classes, but is a bit more complex to setup and use with just Python. If you are more used to Eclipse, the Eclipse PyDev might be your choice for Python development. The steps to get it running for use with SikuliX are similar to the following steps for PyCharm. If someone wants to document the details for Eclipse PyDev, he/she is always welcome - I will not do it on my own. Just follow the steps mentioned in the chapter Setup a Jython environment above. Download and install the PyCharm Community Edition. Start PyCharm and make sure to have closed all projects and be in the start-up window titled Welcome to PyCharm. At bottom right in the menu Configure select Preferences. You should get a dialog window titled Default Preferences. At the left side select Project Interpreter and choose your installed Jython by pointing to the contained .../bin/jython script/command-file. 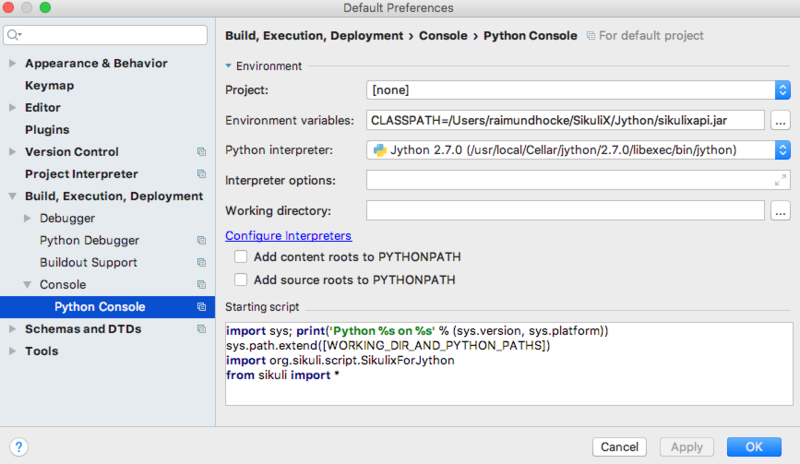 Click Apply and watch how the Jython setup is analyzed and implemented in PyCharm. If it worked click Ok.
With respect to SikuliX features used in Python scripts look here for details. As with the step before get the Default Preferences dialog open. 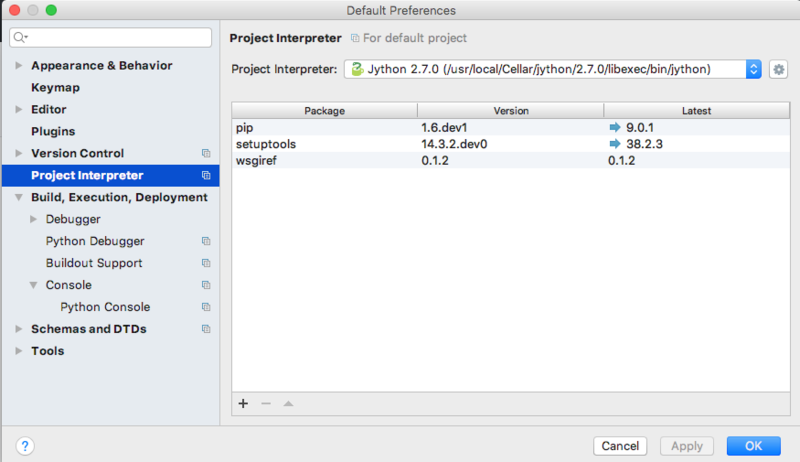 At the left side select Build, Execution, Deployment… Console… Python Console. To the Environment variables add antry CLASSPATH, that points to a valid sikulixapi.jar (created using setup). In the Starting script you might add the 2 lines ` import org.sikuli.script.SikulixForJython from sikuli import * ` so each time you start a console, the prompt is already prepared to know about SikuliX features. You can run ready Robot scripts out of the box in the Sikulix context (IDE or from commandline). The needed Python module robot ( from robotframework 3.0 ) is bundled with the sikulixapi.jar. At runtime and already with setup, the module is exported to the folder <SikulixAppData>/Lib, which is on sys.path automatically. So there is no need to have anything else available than a suitable setup of SikuliX. signal, that you want to run an inline Robot script, that follows on the next lines terminated by """). This construct is a multiline Python comment, that can be used as a string. BE AWARE In the standard, a report HTML will be automatically opened in the standard browser at termination. If you do not wnat that (e.g. in unattended situations) use this instaed as the first 2 lines. Take care: after robot 1 space, a linefeed directly after silent and nothing else. Normally when working with SikuliX features, you have to do some Robot Keyword implementation at the Python level. To Robot you tell where to find these implementation using the Library setting. In this case we have the implementations inline in the same scriptfile according to the Robot rules packed into a Python class having the Keyword methods according to the Robot naming conventions. At runtime this class will be exported to a Python file, whose absolute path is then replacing the Library setting. If you have the Keyword implementations somewhere outside, then you have to put the correct path specification into the Library setting. Another option is to reference a jar file as a Library again according to the Robot specifications. BE AWARE for the keyword library, the Name in the file name Name.py and the statement class Name() must be the same and start with an uppercase letter. Of course you can use any other method, to fill a string representing a valid Robot script, provided the first line contains the string robot and only that (denoting the script type for runScript). A library .py file being either in the script folder itself or in the folder containing the script folder is found automatically. So simply the library name is enough in this case. In all other cases you either have to specify the absolute path off the .py script (take care with windows - see above) or use addImportPath() to add the folder containing the library .py file to sys.path, in which case again only the name is sufficient in the Robot script. It is strongly recommended, to always specify the outputdir= parameter since otherwise the reportfiles will be written to the working folder (from where you are running), which might not always be what you want. to get the SikuliX context ready. … so play with it and report requests and bugs as needed: always welcome. Any client solution, that is able to issue valid HTTP GET requests against the server at localhost:50001 can be used. of course any browser using it’s address line or links in a webpage like here in the below showcase. Ruby scripts are not yet supported. Go through the following showcase, to get a feeling about what is possible. Start the server as mentioned above and make sure it is running. Just have a look at it, close it and come back to this page. Specific-Information is what it says, in case of RUN it ends with the string representation of the return value. Make sure, the server is stopped and then start it again. Since this playground is a static environment, you have to implement some prerequisites, to run scripts. To your home folder add a folder sikulixrunserver. To prepare a Python script, add a script named testpy.sikuli (take care, that it contains a testpy.py as well) to the folder sikulixrunserver. This could easily be accomplished by using the SikuliX IDE using SaveAs with an existing script. To get a valid return code, use exit() (yields 0) or exit(n). Other script terminations will be reported as FAIL. print "I said: hello world"
Be aware: Print output of your script will be sent to the terminal/commandline session of the server. Besides redirecting the server’s output to a file and grabbing it with some command like tail, there is currently no feature to redirect the output of one scriptrun to one file. If you need something like that, have a look at SikuliX’s debug feature. … and try to implement your own, tailored solution. In your script you will get ``–parm1=value1``and so on in ``sys.argv``and so on. The server output reports the identified parameter strings. It is your own job then to split each sys.argv item into the parameter name and the given value (Python method split()). Be aware: Everything is just strings. It is not tested, what the whole processing chain does with parameter strings containing other characters than letters or numbers. Feedback and suggestions are welcome.